Washington-based power trio MOS GENERATOR will bring their heavy riffing to stages this fall on a US/Canadian headlining tour. Set to commence September 21st in Port Angeles, Washington and run through nearly two-dozen venues upon its conclusion October 13th in Portland, Oregon, the journey includes stops at Descendants Of Crom Fest in Pittsburgh, Pennsylvania as well as Doomed & Stoned Fest in Indianapolis, Indiana. The latest tour follows the band's month-long US trek earlier this year which included sixteen dates supporting FU MANCHU as well as an appearance at the 2018 edition of Hellfest in Clisson, France. See all confirmed dates below. 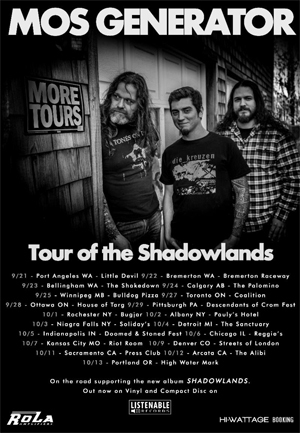 Comments MOS GENERATOR founding guitarist/vocalist Tony Reed, "This will be our first time out on the road with the new album Shadowlands at the merch table. We were hoping to have them on the Road Rats tour with FU MANCHU in May but that didn't happen, so we'll make it up to you here and make sure to bring plenty. We will be playing a large majority of the new material as well and that's a treat for us. This is also our first tour across Canada. There are some hard drives, but we are excited to get to those territories. MOS GENERATOR released their Shadowlands full-length in North America earlier this year via Listenable Records. Heavy Blog Is Heavy hailed an, "appetizing, fun slab of heavy rock songs that should please any fan of the genre," while Metal Nexus championed an album of, "...power, melody and heart... classic rock, infused with stoner tendencies and superb musicianship." Shadowlands was recorded in three sessions - June 2017, November 2017 and January 2018 - at the HeavyHead Recording Company in Port Orchard, Washington and comes swathed in the cover art of Adam Burke (PILGRIM, SATAN'S SATYRS, HOODED MENACE, ARTIFICIAL BRAIN). MOS GENERATOR formed during the Winter of 2000 in Port Orchard, Washington from the ashes of a decade-long on-again-off-again collaboration between its three members, all of which are long time veterans of the road and studio. The need to strip down to the basics of hard rock was apparent from the start and continues to be the foundation for the band's recent material. MOS GENERATOR has released seven studio albums, a retrospective album, a live album, and a plethora of split releases. 2015 brought in a new rhythm section and touring possibilities far beyond the limitations of the original lineup. This new lineup has changed the band into a relentless touring machine, delivering critically-acclaimed performances both states and abroad.